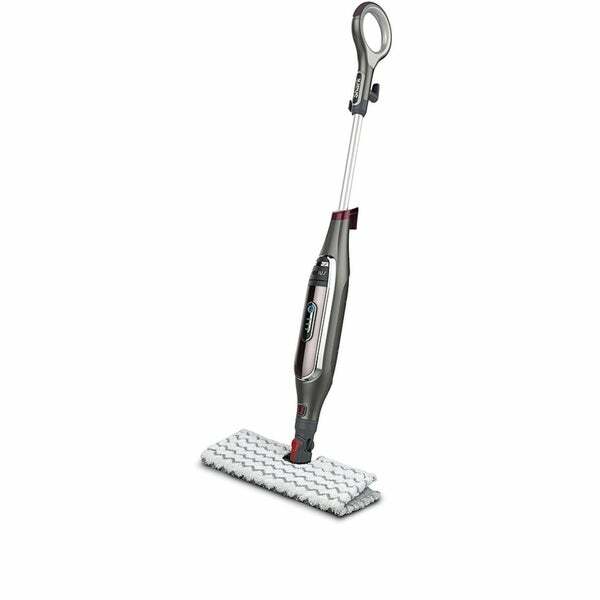 The Shark Genius Steam Pocket Mop System features next-generation advances like the Genius mop head with Touch-Free Technology, Dirt Grip pads, and Steam Blaster technology. The Genius Steam Mop sanitizes* sealed hard floors, when and where you need it. And the Direct Steam Channeling system delivers steam directly onto stains, for excellent hard floor cleaning. Touch-Free Technology means there's no more wrestling with dirty pads. Just press the pad release button, and the used pad falls away automatically—you'll never have to touch a dirty pad again. You'll get extra-targeted steam power with our Steam Blaster technology. The Steam Blaster attacks tough, stuck-on messes, and easily loosens debris from crevices and corners. Washable, dual-sided Dirt Grip pads absorb liquid and generate better engagement with the floor surface. When finished, simply drop the pad in the wash and reuse. * Sanitization studies were conducted under controlled test conditions. Household conditions and results may vary. With Genius mop head in HI mode only when used with steam mop. Not when using Steam Blaster. See Owner's Guide for instructions.